Can you confirm these amateur observations of Hapsidophrys smaragdinus? Distribution Uganda (DOUCET 1963), Zaire, Angola, Democratic Republic of the Congo (Zaire), Congo (Brazzaville), Gabon, Equatorial Guinea, Cameroon, Central African Republic (JOGER 1990), Nigeria, Togo, Benin ?, Ghana, Ivory Coast, Liberia, Sierra Leone, Guinea (Conakry), Guinea-Bissau, Gambia (HÅKANSSON 1981), Tanzania [HR 31: 55], São Tomé und Principé (Gulf of Guinea). Types Lectotype: RMNH 909 (Eschricht) designated by Hughes and Barry, 1969: 1017; one syntype is 750 mm. Comment Not listed for Tanzania by BROADLEY & HOWELL 1991. 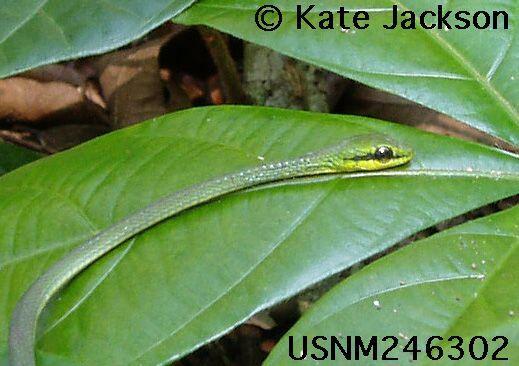 Has been reported from Sao Tome but records neen confirmation (SCHÄTTI & LOUMONT 1992). Not reported from Benin according to ULLENBRUCH et al. 2010. Type species: Dendrophis smaragdina SCHLEGEL 1837 is the type species of the genus Gastropyxis COPE 1860, now a synonym of Hapsidophrys FISCHER 1856. Etymology Etymology (genus): Hapsidophrys from old greek ὰψις, hapsis, « curvature, arc », ὄφρῦς, ophrys, « eyebrow », referring to the fact that the head, short, is strongly arched back and forth between the eyes. Broadley, D.G. 1966. 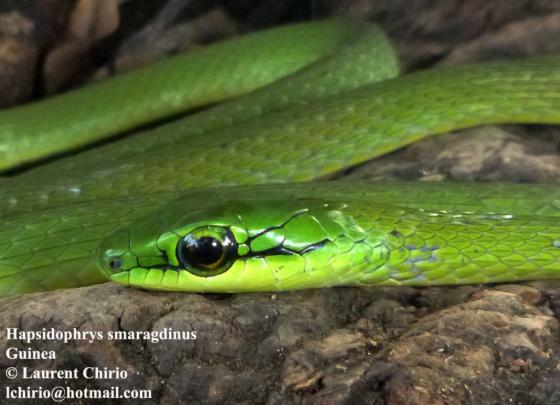 A review of the Natal green snake, Philothamnus natalensis (A.Smith), with a description of a new subspecies. Ann. Natal Mus. 18 (2): 417-423. Doucet, J. 1963. Les serpents de la Republique de Cote d'Ivoire. Acta Tropica (Basel) 20: 201-259, 297-340.